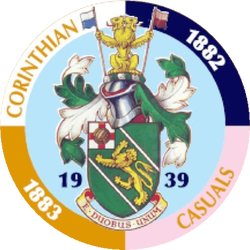 Corinthian-Casuals were founded in 1939 as a merger between Corinthian (founded in 1882) and Casuals (founded in 1883), playing one game as the new team before the outbreak of World War 2 caused all football to be suspended. After the war, the club joined the Isthmian League, where they remained until suffering relegation to its Division 2 in 1974. After continuing to struggle in Division 2 (which was soon renamed Division 1), the club suffered relegation to the new Division 2 in 1978. 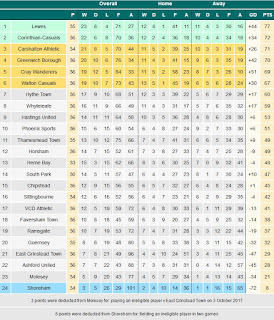 At the end of the 1983/84 season, new groundshare rules forced the club out of the Isthmian League and into the Premier Division of the Spartan League and, in their first season in this league, they suffered relegation to its Senior Division. However, their first season in the Senior Division saw them win the title to immediately earn promotion back to the Premier Division. They then remained in the Premier Division until being transferred to the Combined Counties League in 1996. 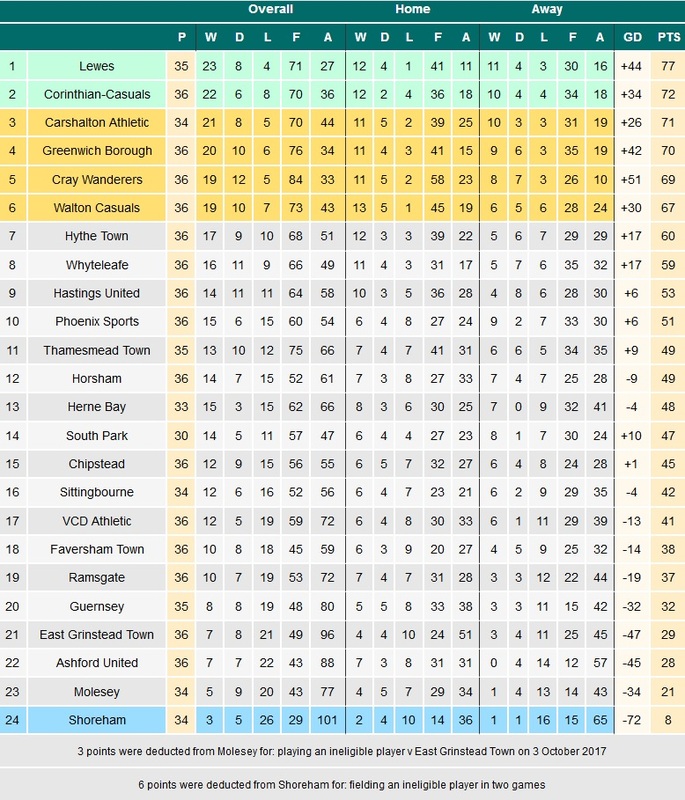 Finishing as runners-up, the club earned promotion to Division 3 of the Isthmian League for the 1997/98 season. League reorganisations saw the club end up in Division 1 South in 2002, before then ending up in Division 1 in 2004 and then Division 1 South again in 2006. They have remained in Division 1 South ever since, losing last season's play-off final to Dorking Wanderers and currently looking likely to go one better and earn automatic promotion this season. In the FA Cup, the club have reached the 1st Round twice, losing 5-1 at home to Watford in the 1965/66 season and losing 4-0 away at Bristol City in a replay in the 1983/84 season. In the 1955/56 season, the club reached the final of the FA Amateur Cup, drawing with Bishop Auckland before losing 4-1 in the replay. In the FA Trophy, the club made it as far as the 2nd Round in the 2002/03 season, beating Barking & East Ham United and Croydon before losing 4-0 at home to Cirencester Town. As for the FA Vase, the club's best run saw them reach the 5th Round in the 1983/84 season, beating Wallingford Town, Chertsey Town, Whyteleafe, Bracknell Town and Whitehawk before losing 4-2 at home to Stamford. 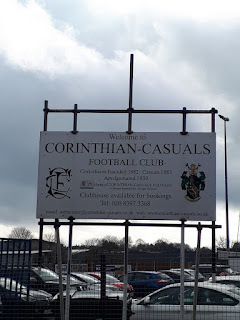 With "The Beast from the East" making it impossible to get to a game the previous weekend, I was determined to get to one last Saturday and, initially, I had hoped to go somewhere a little further out such as Banbury. However, it quickly became clear that this would not be possible for two reasons: for one, I would not have enough money available afterwards to justify it and, with family visiting me for the weekend, I had to be back well before 7pm for an evening dinner. Once this became apparent, I starting looking at the nearby fixtures on the Groundhopper app to find something that was reasonably nearby, but not so close as to be able to be done for £2 to £5 on the train; I was lower on money than I would have liked to be, for sure, but not low enough to need to go to one of those games. However, games I could get to on the train for above £5 but below £10 were in short supply, at least in terms of games that excited me. However, one did stand out, namely Raynes Park Vale's game against South Park Reserves. Ordinarily, I would rule this out straight away - as I would prefer not to watch Reserves football if I can possibly avoid it - but with so few exciting options this seemed a good option, although only because I have been eager to visit Raynes Park Vale ever since meeting a bunch of their fans at Cove back in October. Unfortunately, even though the weather hadn't seemed that bad during the week - some rain here and there for sure, but nothing drastic - an overnight deluge on Friday left the game at Raynes Park Vale in doubt and, at around 11:15am, the game was announced as postponed, along with another of my options at Chessington & Hook United. With these postponements occurring, I then checked on my other option here and, seeing that the game was on, I quickly had a late breakfast (I didn't wake up until 11am on Saturday, for some reason) before buying my train tickets and heading to the station just after 12:30pm. The train journey was another very easy one - although the 25-minute wait at Motspur Park was highly tedious - and I got to the ground at around 2:25pm, paying £5 for admission and £2 for a truly fantastic programme (easily the best non-league issue I've picked up this season, and almost on a par with the programme at Arsenal back in October). I then paid £2 for some cheesy chips (which I later discovered, through an unusual fan song, are apparently considered the best in the league) and ate these before doing a quick circuit of photos, opting to stand by where the players came out for kick-off. A look at the table before kick-off showed the home side in 2nd and firmly in the promotion race, while Thamesmead sat in mid-table. With this, and with both teams clearly having a propensity to score plenty of goals and, as such, I was expecting an exciting contest on this occasion. Corinthian-Casuals fans showing their support just after kick-off. Initially, it was the away side who started on the front foot, putting some early pressure on the Casuals defence with some very direct and efficient play which, based on these opening stages, Casuals hadn't fully anticipated. However, as would be expected from a team chasing promotion, the home side soon adapted to this style of play and started to exert their influence on the game, the piercing runs from Max Oldham and Jordan Clarke in particular causing chaos in the Thamesmead defence. It was from these two players that the first decent chance came after around 10 minutes, Clarke making a run down the left flank and then switching the play to Oldham on the left, who dribbled into the box, did some step-overs to get past the defender before getting a shot away, only for Thamesmead keeper Lewis Carey to make a good save to deny him. Oldham was at it again seven minutes later, but this time he was recklessly taken out in the box to earn his side a penalty. Josh Uzun stepped it to take it, and slotted the ball into the bottom corner to Carey's left to give Casuals the lead. Casuals then took complete control of the game and doubled their lead five minutes later, Warren Morgan playing the ball across the goal for a Thamesmead defender to tap into his own net (Morgan himself is credited with the goal online, but I had a perfect view of it and can say with absolute certainty that it was an own goal. Either way, this goal gave Casuals a decent lead and, with the extent to which they were dominating, it began to seem like a question of how many more they would score before the final whistle. However, while the game had largely been flowing freely up to this point (despite the referee having a propensity to give free kicks for slight pushes (pushes that most referees tend to ignore, for better or worse)), it started to become a little more niggly, with the Thamesmead players becoming increasingly frustrated at the referee and his decision-making. After they had claims for a penalty dismissed just after the half hour mark (for a push similar to those the referee had been giving free kicks for all game, and the sort that he gave a free-kick for just 30 seconds later), the anger of a few Thamesmead players threatened to boil over, although these were handled and dealt with excellently by all parties before any farcical mass brawls came close to starting, and without the referee even needing to brandish any cards (he only booked one player all game, and that was given to Clarke for time-wasting late in the second half). Events then proceeded in similar fashion for the rest of the half, with Casuals constantly pushing for a goal and being unable to find the finish, while Thamesmead struggled to carve out any real chances. 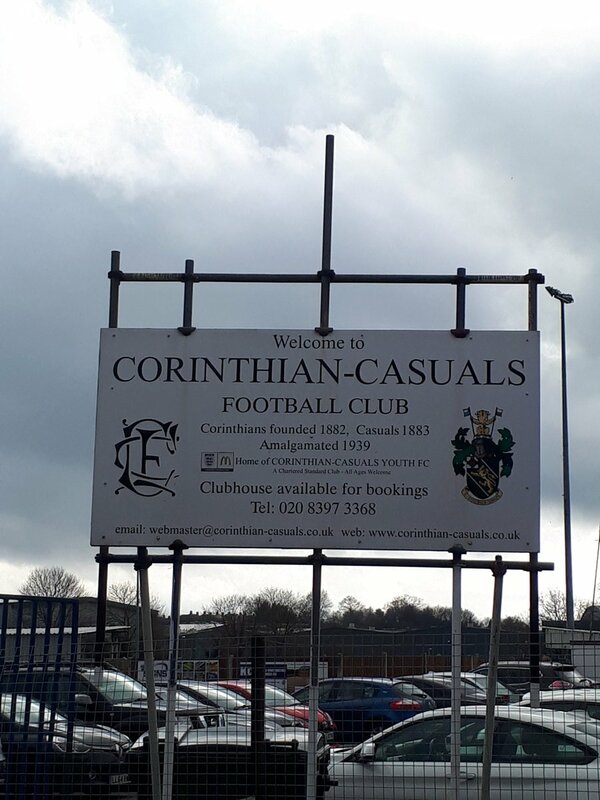 2-0 to Corinthian-Casuals at half-time. After a pretty exciting first half, I was expecting the second half to unfold in similar fashion, but ultimately much of the second half was a complete non-event, with neither side able to do much of note in the final third, with everything getting bogged down in midfield: while the first half had seen free-flowing football from Casuals throughout, as well as some from Thamesmead until they conceded the penalty, that was almost entirely absent in the second half. The game also seemed a lot more stop-start in the second half in general, with the ball seemingly going out of play every couple of minutes, or breaks being given for injuries and fouls, and this naturally did not help as neither team could establish any kind of flow in their play. 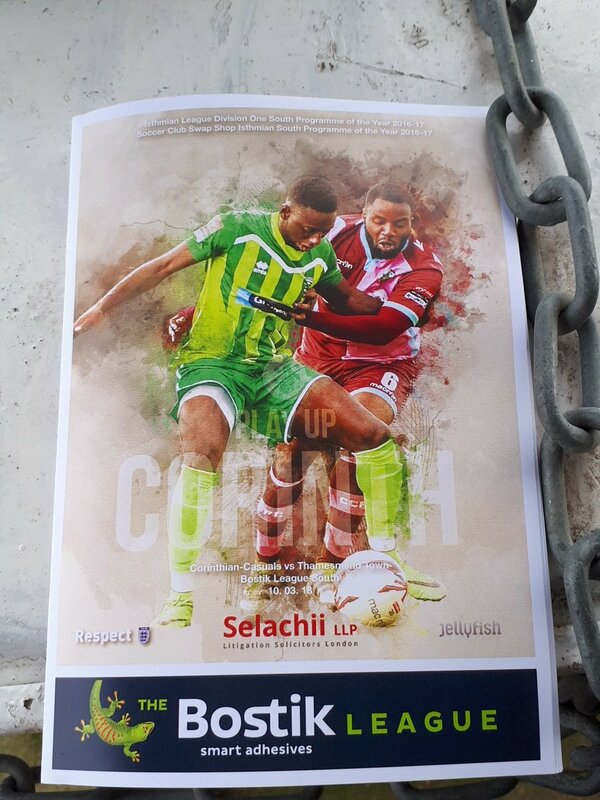 However, this did improve in the last 10 minutes of normal time, with Casuals starting to become a little more daring going forward again and almost reaping the rewards, while Thamesmead's urgency increased as the clock started to run out. Then came ten minutes of added time, and it was in this that Thamesmead played as well as they had done all game, taking advantage of some Thamesmead time-wasting to create a few more chances, although still without really looking like scoring. In fact, such was how unlikely they looked to score that when they did after 7 minutes of added time through Paul Vines - a cross from the edge of the box that he headed in from about 2 yards out - that no one thought they actually had done, instead thinking the goal had been ruled out for offside: this was not helped by the fact that the players did not celebrate and that there was no audible celebrations from the away fans (although I'm not sure there were more than a couple here anyway). In any case, this late goal gave Thamesmead the onus to push, while Casuals kept hoofing the ball back up the pitch every time they got it to run the clock down. Ultimately, despite the best efforts of the away side, Casuals held out to earn the points. As I said earlier, this game was odd as, while the first half was exciting, interesting and compelling, the second half completely lacked any kind of excitement, energy or urgency, with the players mostly looking disinterested until the last 10 minutes of normal time and the 10 minutes of injury time. Ultimately though, what I would say is that the home side deserved the points, but should have secured them much more comfortably and not had such a late scare as they did. Still, based on that first half performance, Casuals should earn promotion this season and, if they can keep the squad together, should probably be fine at Step 3 next season. As for Thamesmead, they looked toothless up front for much of the game, but they don't seem a bad side either and did at least play their part in proceedings rather than letting Casuals walk all over them, although they will be disappointed that they didn't come away with a point after their late push, and that they didn't play that way all game. 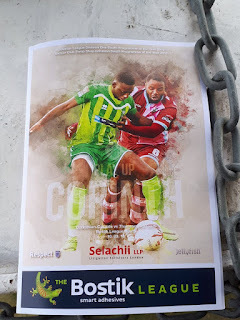 Today's game was also my first experience of the "Isthmian time" that many on here have previously described, with the game kicking off at 3:03pm and not finishing until 4:58pm, although the 10 minutes of second half added time obviously skew that somewhat. On the whole, this was a reasonably enjoyable groundhop, with a decent game, decent food and a great atmosphere throughout (I don't know why they do it, but I enjoyed some of the home fans singing every time a train went by on the train line overlooking the ground). Still a little frustrated that I've only seen more than three goals once in 8 games so far in 2018, but it's not the end of the world. As for next week, unless the weather decides to continue being a nuisance, I will be paying a visit to Thurrock's Ship Lane, what with them folding come the end of the season and this being my only real chance to watch them before the season ends. If the weather does intervene, I'll likely still go further out, but I have no idea where at this stage. King George's Field was a better ground than pictures online had led me to believe, with areas on cover on three sides and not an Atcost in sight. The main stand on the near side is a mixture of seating and standing, with seating for around 150 people and standing space for a similar amount. Behind each goal is a covered terrace, with the one behind the near goal being longer and being able to hold around 400-500 people, while the one behind the far goal is smaller and probably holds around half as many people. The dugout side is open hard standing, but this is unsurprising as there is not a massive amount of room on this side of the ground. The ground has an overall capacity of 2,000 but, with the dugout side not having too much room, there isn't much room for any necessary expansion, although I'm not sure how much - if anything - they would need to add if they do indeed achieve promotion to Step 3 for next season.